Alopecia Areata is a hair loss condition characterized by the rapid onset of hair loss in a sharply defined area. Any hair-bearing surface can be affected, but the most noticeable surface is the scalp. The reason alopecia areata occurs is not completely known. In some cases it is associated with other diseases, but most of the time it is not. Current evidence suggests that alopecia areata is caused by an abnormality in the immune system. This particular abnormality leads to autoimmunity. As a result, the immune system attacks particular tissues of the body. In alopecia areata, for unknown reasons, the body`s own immune system attacks the hair follicles and disrupts normal hair formation. 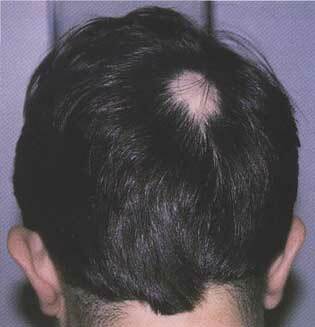 The characteristic patch of alopecia areata is usually round or oval, and is completely bald and smooth. "Exclamation-mark" hairs may be seen at the margin of the patch. These are broken, short hairs that taper at the base. Pulling slightly on these hairs causes them to fall out. Some people may experience a slight burning or tingling in the area of hair loss. 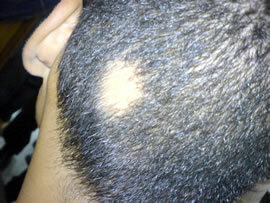 The progress of alopecia areata is unpredictable. Some people lose hair in only a small patch. Others may have more extensive involvement. Alopecia totalis is the loss of 100% of scalp hair. 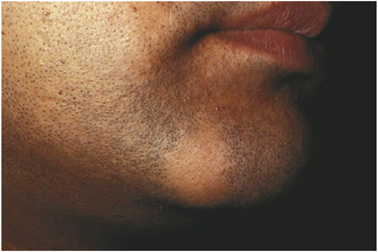 Alopecia universalis is the loss of 100% of body hair. -Many treatments are promoted which have not proven to be of benefit. Alopecia Areata being an auto-immune disease needs immunity correction. homeopathy discerns that the body has within it a controlling and defending force and power .it is only when this fighting power or resistance is disturbed, do we fall ill. The disease is thus not an affection of the parts but a disorder in the patient as a whole .Since one patient differs from another each requires a different medicine based on his individual and mental symptoms.